I’m sure every parent is familiar with the phrase “I had a bad dream”. We first encountered this problem about a year ago, when our little one was coming up to 4 years old. Every so often, the patter of his little feet at 2am would announce his presence in our bedroom, where he would explain that he couldn’t sleep because of the bad dreams. My solution was simple: give him good dreams instead. And it worked. All I had to do was tuck him back into his bed and reel off a short list of some of his favourite things to give him something to think about that would banish those bad dreams. It was easy for the first couple of times – it took me no time at all to come up with Buzz Lightyear, a rollercoaster, ice cream, and a christmas tree. But at 2am my brainpower is somewhat limited, and after a few nights of this I was running out of ideas. So the “Dream Box” was born. I typed up a list of as many of his favourite things as I could think of – TV characters, real people, food, places, and things. 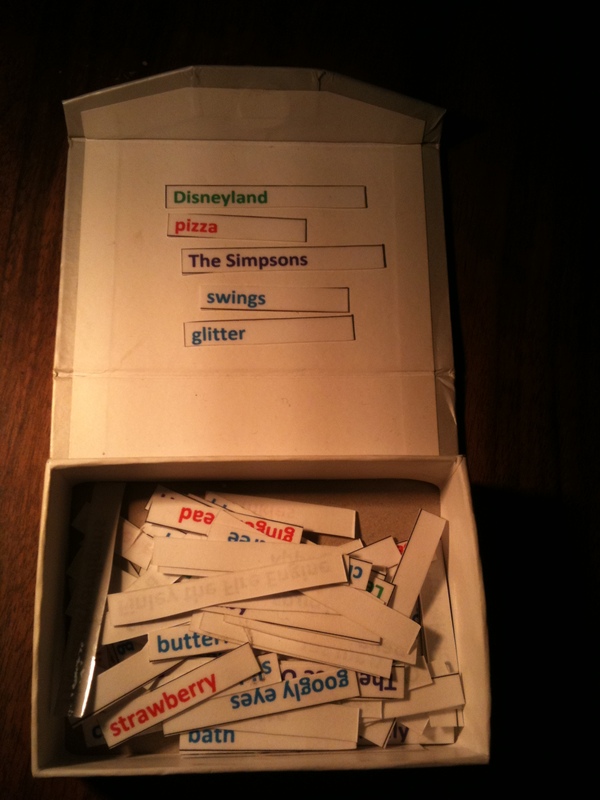 I laminated the list and cut it up into individual words, which I put into a box that had once contained some kind of conference freebie and was waiting in my drawer for its opportunity to be reused. 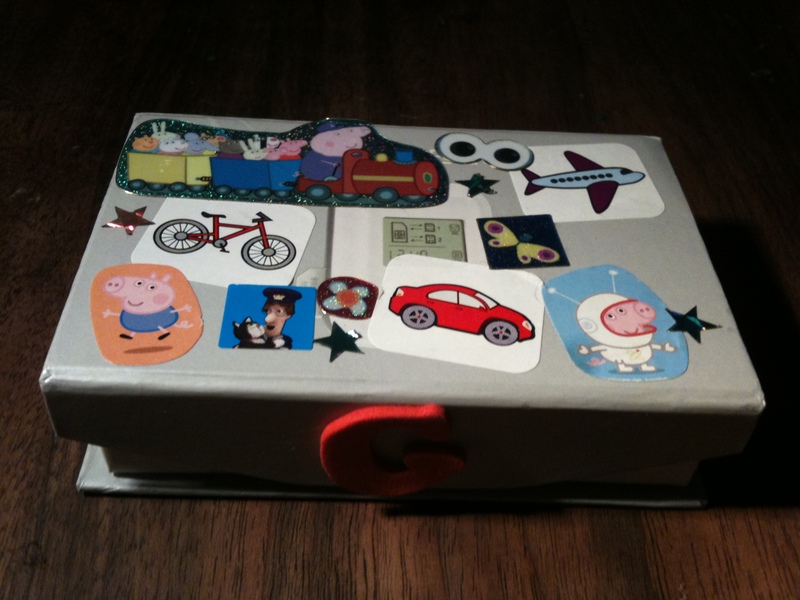 Then I just decorated it with a few stickers. 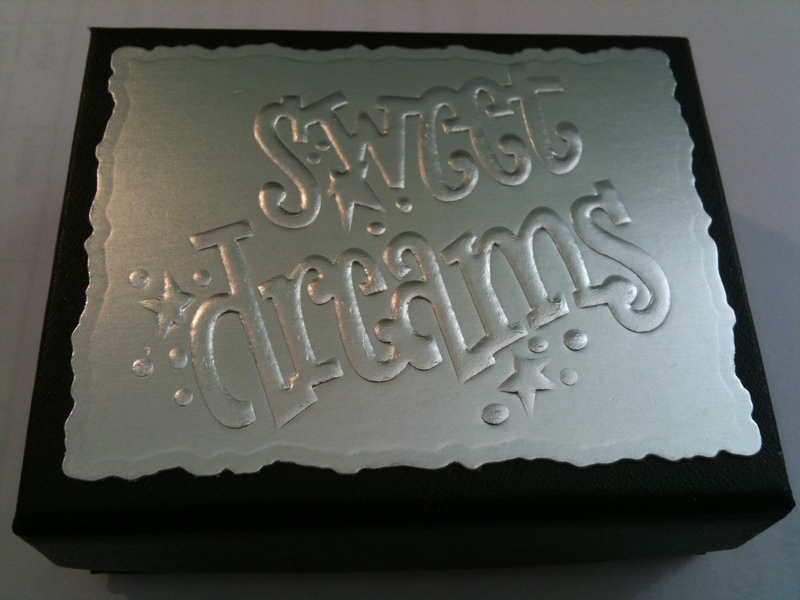 So now I have decided to share the dreams, by making Dream Boxes to sell in my Folksy Shop. They are rather more attractive than the original, and I can personalise them to include the recipient’s favourite things. Just don’t tell my son, or he’ll be wanting a new shiny one too! 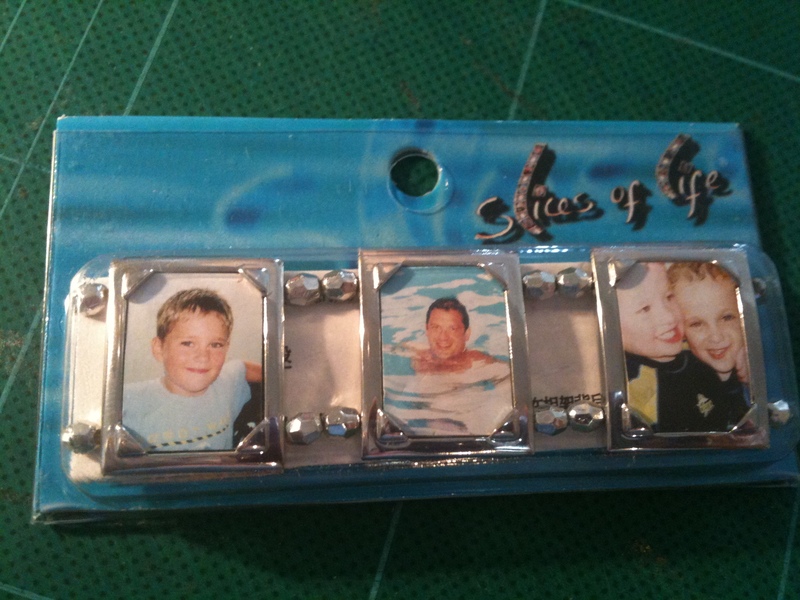 A while ago I bought some photo frame bracelets. I like the idea and I am hoping that other people will too, as I plan to sell them. But they looked very uninspiring in their original packaging, so I knew something would have to be done to make them more appealing. I immediately thought that replacing the stock photos with patterned card would improve their look, and knew that a gift box would help too. So they got thrown into the “random craft things” drawer to await further action. Then yesterday I was putting away some new purchases including this pad of patterned paper, acquired last week from my current favourite shop, Tiger. And I had a Eureka moment. 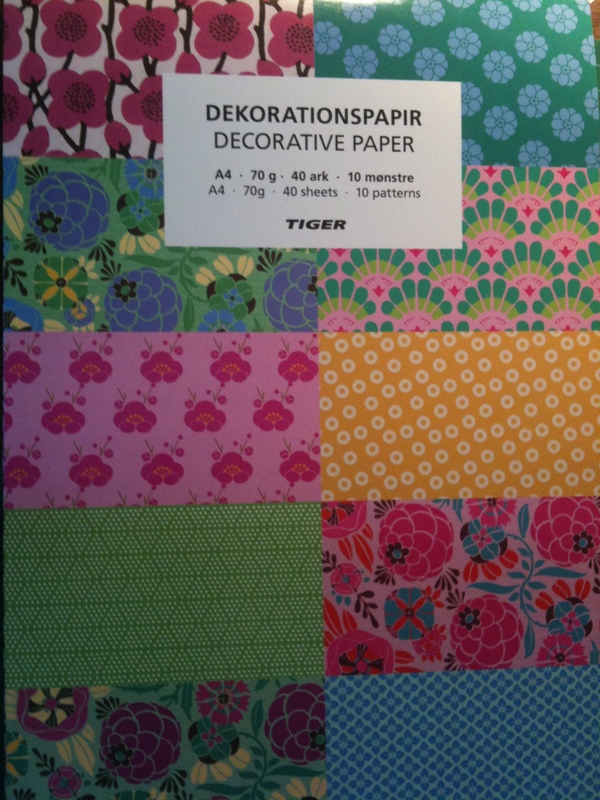 Not only would this paper be great for the frames, but I could also use it to make matching gift boxes. 1. Take your square of paper. 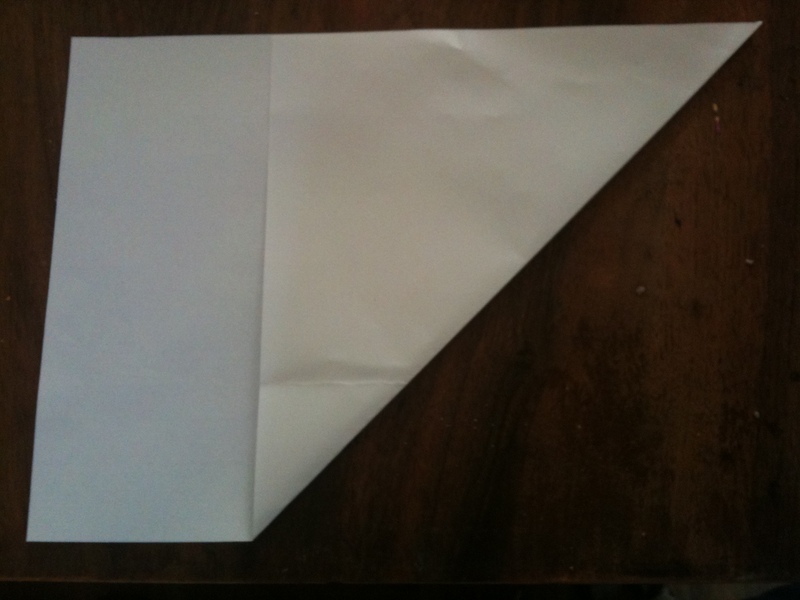 I used A4 size paper which I squared off by simply folding one corner to the opposite side and trimming off the excess. 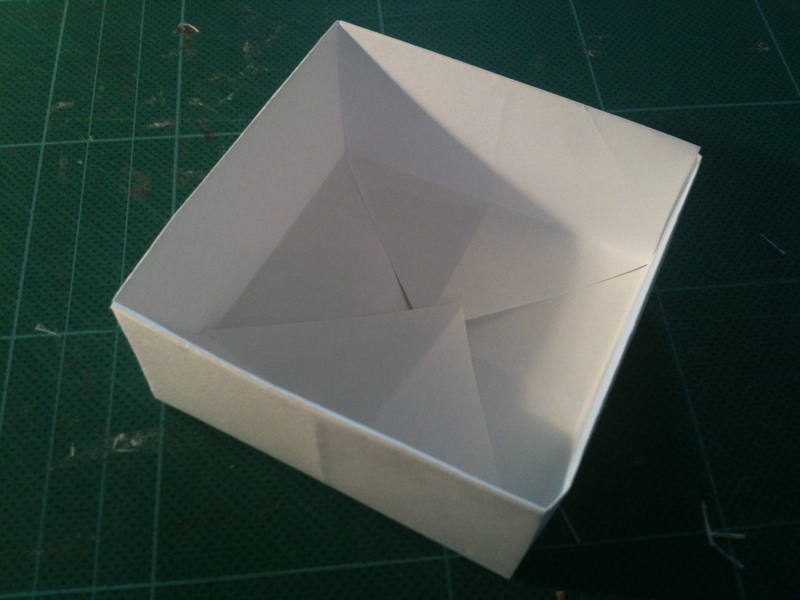 While you are at it, fold the square diagonally in the other direction as well, and the point where the two folds cross is the centre of your square. 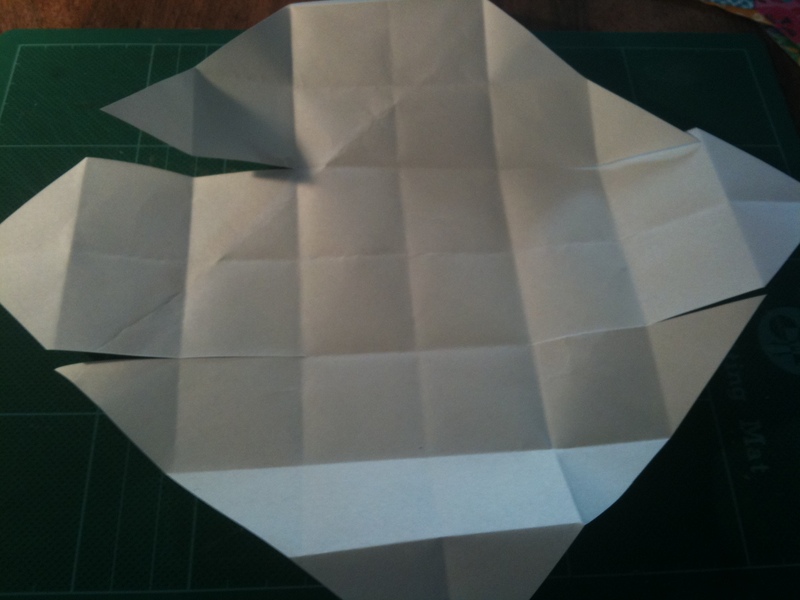 Then fold again so that the edge of your fold meets the centre line. Unfold each corner before moving on to the next one. You should end up with a piece of paper which has lots of little square fold lines marked out on it. 3. Make four cuts, two sets of two at opposite corners. 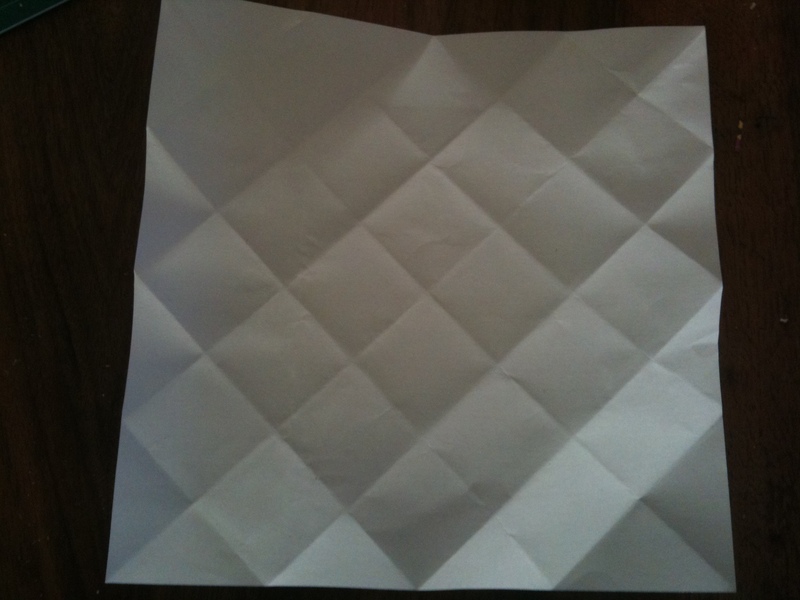 Use the fold lines as a guide, cutting in two squares long and two squares wide. 4. 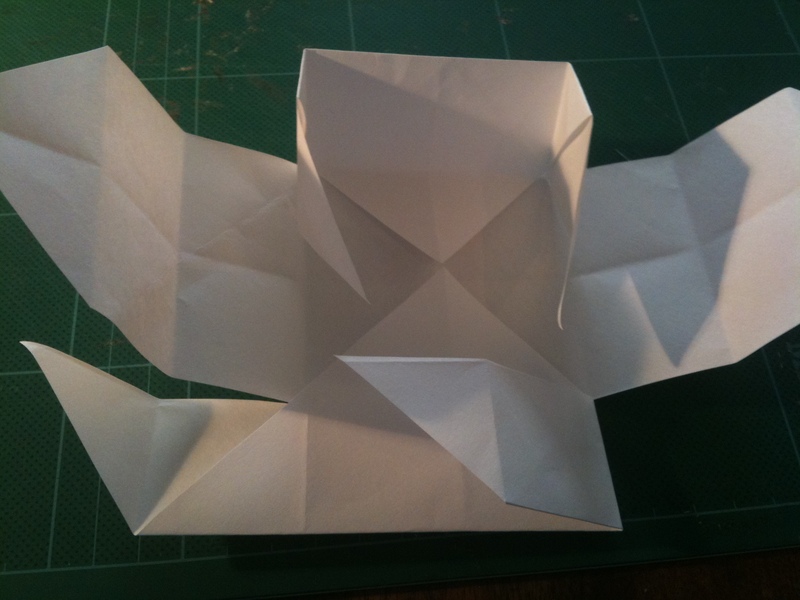 Fold up the corners you haven’t cut, bringing the point into the centre. You now have two sides of the box, plus some support for the other two sides. 5. 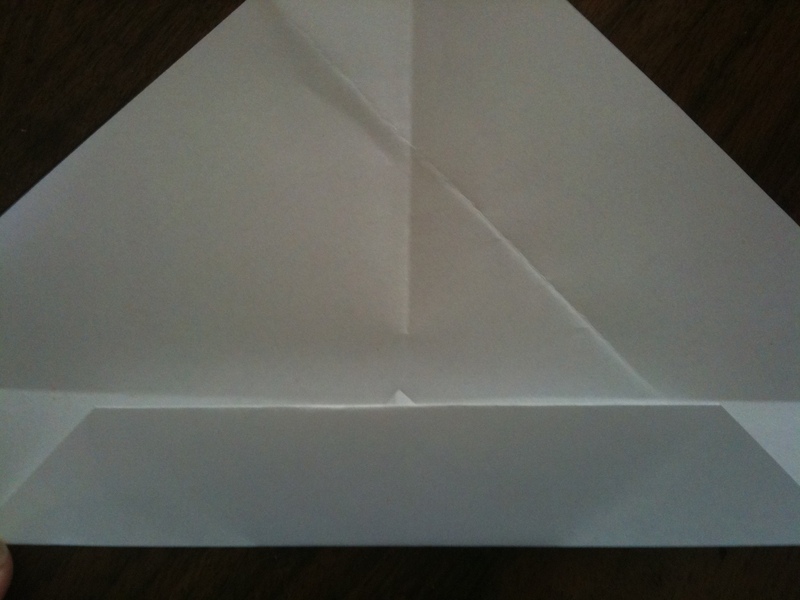 Then fold in the other two corners, so all of the points meet in the middle. And you’re done! It shouldn’t need any glue to stay together, but free free to add a little dot under the corner points if you like – sometimes they just don’t want to stay put! 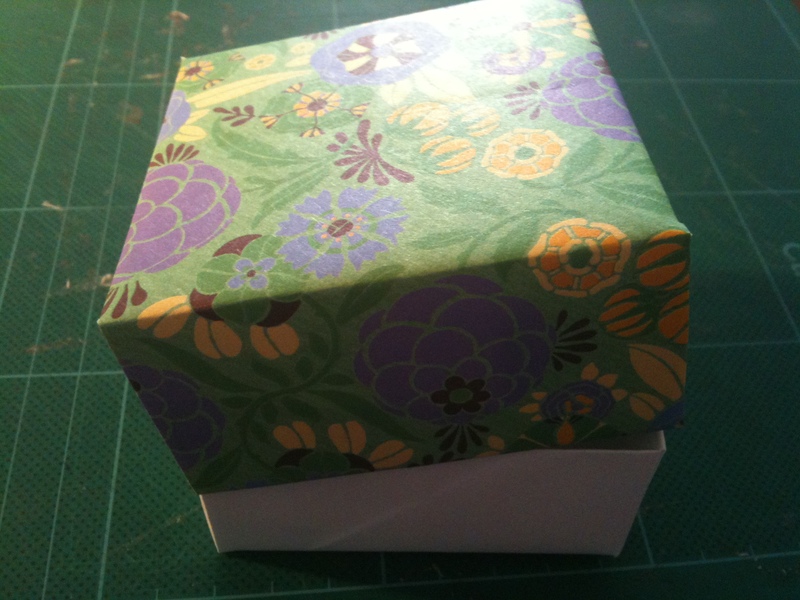 This white box was actually the base of my boxes, and the lids were made using the coloured paper. To make the bases and lids fit together, the square for the bottom needs to be slightly smaller – I chop off about 1/4 inch from each side before folding, and that seems to do the trick. I think this is definitely an improvement on how the bracelet looked at the start, and it didn’t cost much money or take much time. Now all I need is someone to buy them! We recently spent a couple of days in Blackpool. Our main port of call was the Pleasure Beach, but we also stopped off at what we have come to call “the machines” – otherwise known as an amusement arcade. Coral Island is the biggest of Blackpool’s many such venues, and was the site of an exciting discovery for me back in the summer of 2004. I grew up in a seaside town, and spent many happy hours on the pier indulging in some low-level gambling. 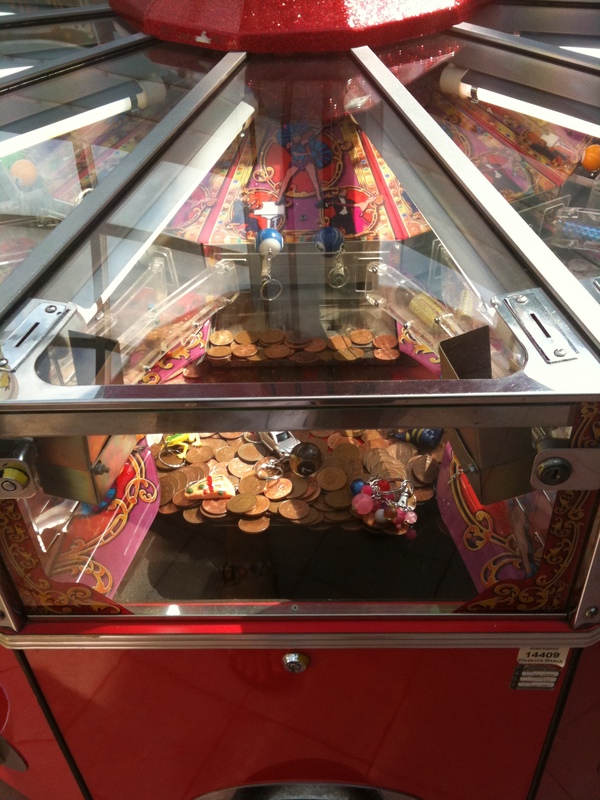 My favourite type of machine was always what I call the Tuppenny Falls – the one where you drop your coins in to join a pile of others and hope that some get pushed off the edge and into your winnings tray. I always knew that this was a game of diminishing returns; slowly but surely the number of coins going in exceeds the number of coins coming out, until you are left with nothing but an aching shoulder and dirty fingers. At least, that used to be the case when I was a child. But what I discovered in that dark and noisy arcade in 2004 is that some places now put small prize items on top of the pile of coins. These items get pushed to the edge along with the coins, and you can actually end up with something to show for all the time and money you put in. Even though (as my husband points out every time) the value of the prize is almost certainly less than the amount of money spent winning it. And so it was that after a week in Blackpool and many hours spent at Coral Island, I returned home with about fifteen or twenty assorted keyrings and other pointless knick-knacks. Which I was very happy with. But that was then. These days I can bag that many prizes in the course of one afternoon, never mind a week. It’s not just that I have got faster at putting the money in, and it’s certainly not that arcade owners have become more generous. Our return trip to Coral Island last week made me realise just how much I have learnt about Coin Pushers (to give them their “official” title) in the last seven years. And now I am going to share some of that knowledge. The first thing to know is that really dedicated prizewinning requires an assistant. When one of those coveted keyrings is just on the edge of the shelf and the very next coin could be the one to topple it over, you don’t want to have to leave your machine to get more change. So try to ensure you have a friend or family member in earshot at all times. Next, choose your machine. (I only ever play the 2p versions; I’ve never been that much of a gambler.) What you want is a machine with a narrow shelf and a fast moving pusher. For the perfect machine, as well as the width of the shelf, you should look at the little perspex vertical wall which you can see just at the back of the moving part of the shelf. This is adjustable, and generous arcade owners will set it at a level that allows only one layer of coins in the back row. This means that whatever stage of the cycle you drop your coin, it will never be wasted by falling on top of another coin. This is particularly useful when children are playing, since they don’t normally have the skill to time their coin drop for maximum pushing efficiency. It’s not often that all three components – narrow shelf, fast pushing, and low wall – come together in one machine, but if you find one like that, don’t leave it until there are no prizes left. It shouldn’t take long. Personally I prefer machines where the coin slot is at waist level rather than eye level. But that is mostly because I normally have a heavy handbag over my shoulder, and a couple of hours spent with that arm raised to coin-slot height gives me neckache. And a lower slot also means that small children can be recruited to help if necessary. When it comes to the prizes themselves, keyrings are quite common and can also be quite easy to win. This is because they spread themselves out, so you only need to get the ring end or the toy end over the edge of the shelf and the rest will soon follow. 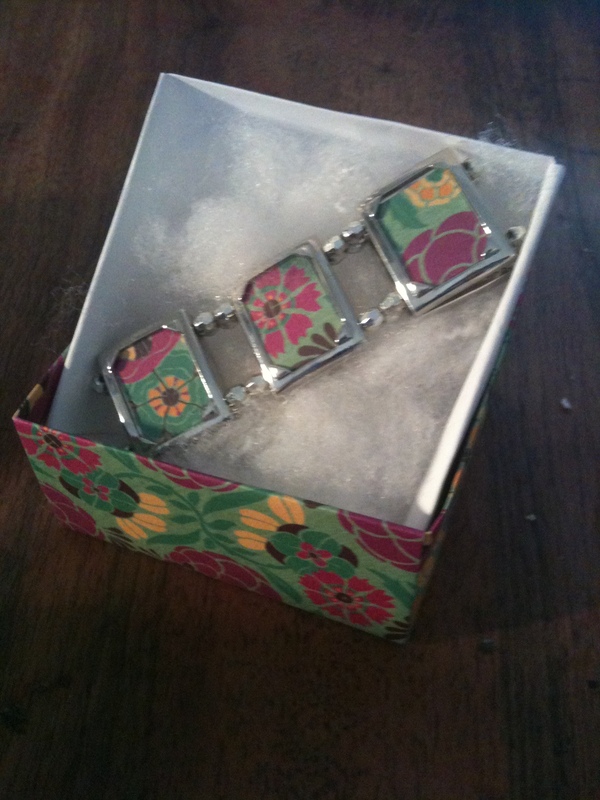 Bracelets are similarly a good thing, especially if they are heavy ones. Small rubber balls can be almost impossible to win, because they tend to roll backwards once they reach the lip of the shelf edge. Items still in their plastic packets normally get stuck against the glass on the way down, requiring a visit from the man with the keys – another reason to make sure you have a helper to hand. And cuddly toys can throroughly clog up the system. It is nearly always easier to win prizes of any kind when they are closer to the middle, especially if you can make use of more than one coin slot so the pile of coins is getting pushed from two directions. On the other hand, prizes that are too close to the side of the shelf tend to disappear into the land of lost prizes, those vast coin boxes that are the reason arcade owners make a living from these machines. And that’s about it. Now you know how to choose the best machines and the easiest prizes, all you need to make yourself a winner is a tub full of coins and a bit of patience. Plus a stubborn refusal to leave the arcade without that one last prize, even when the rest of your family are complaining about empty stomachs and over-running parking meters. 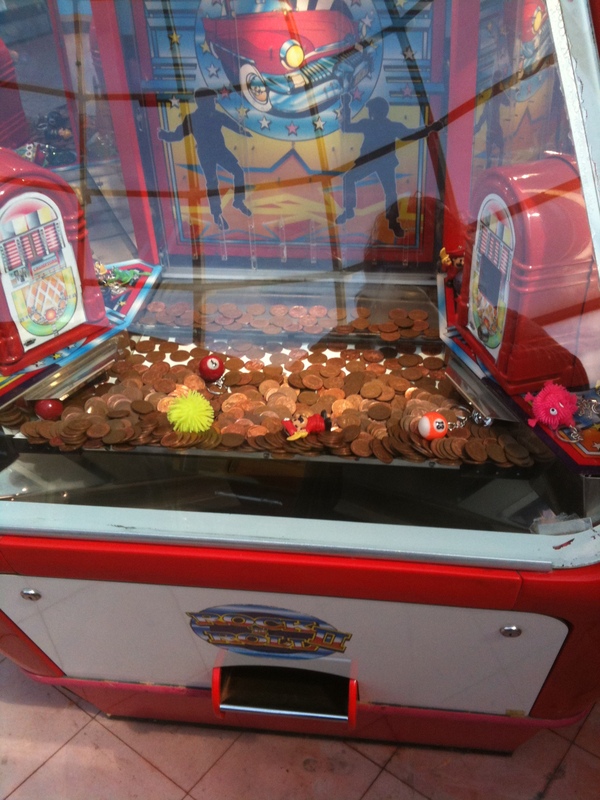 So next time you are at the seaside, grab yourself some two pence pieces, and before long you too could be the proud owner of a box full of amusement arcade prizes. I had seen instructions for making bath bombs before. But I was always put off by the danger of premature fizzing – the part in the instructions where you have to spray on just enough water to make it all stick together but not enough to set off the reaction that should only happen in the privacy of your own bathroom. So I was delighted to come across this variation. This makes enough to fill a normal sized square ice tray, with a little left over. I mostly use one from IKEA which has 16 holes that are a flowery shape. I’ve also done star shaped ones, although they were a bit trickier – it’s best to choose a shape without thin parts which could break off. The ratio of bicarbonate to citric acid is a straightforward 3:1 so you can increase or decrease quantities to fit different size moulds so long as you retain that ratio. And all you do is mix the two powders together before adding the essential oil and the food colouring, if desired, a little at a time (which is where the pipette comes in handy), stirring it in well. You can also add dried flower petals such as lavender or rose, if that is appropriate for the oil you have chosen. Then just press the mixture into the moulds, very firmly. You will be surprised at how much you can fit into those tiny holes when you press it down really hard. Leave it for a good few hours – I normally wait overnight – then carefully turn them out. They will have taken on enough moisture from the air to make them stick together without starting to fizz. 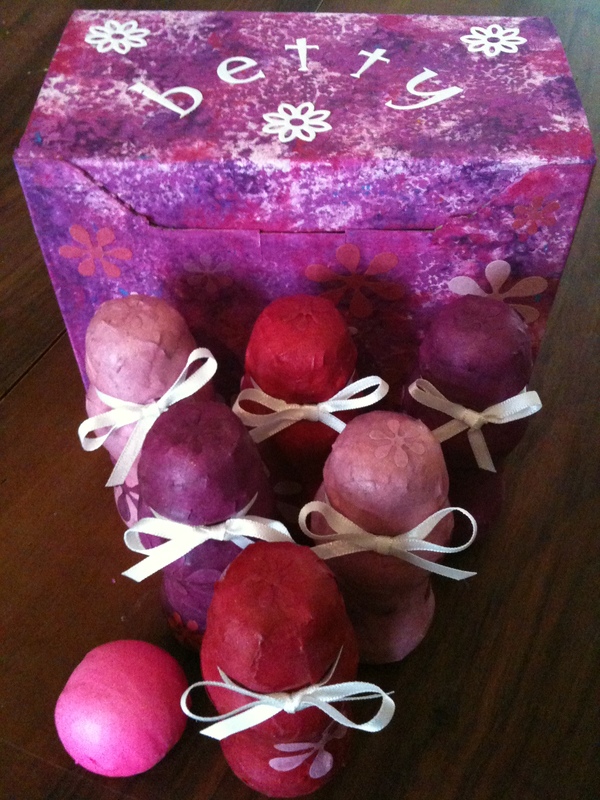 I made loads of these for Christmas and can’t believe I don’t have a photo of any. I made them in the shape of stars, with some cosmetic-grade glitter sprinkled into the moulds first so they came out sparkly. Then I put them into a (clean) coffee jar, decorated it with gold glass painted stars, and added a ribbon and a label. I used a ready made christmassy oil blend of cinnamon, clove, nutmeg, orange and pine, which saved me having to work out the right mixture myself. I’m not sure if this no-added-water method would work for big bath balls, but it’s certainly simple and effective for these smaller ones. My four-year-old can even make his own, with just a little supervision and plenty of blue food colouring! Living with a four-year-old is fun and frustrating in equal measure. My particular model never stops fidgeting, touching things and talking. In particular, the questions never seem to end. Today I made a note of all the questions that he asked over a six-hour period. Bear in mind that this represents barely half of our normal day. Plus I actually got about an hour’s peace while he was sitting in the shopping trolley and playing with his ipod. Can I play Gator Golf? Can I play Hungry Hippos? When can we go to Cadbury World? Can we do penguin dancing when we get home? What is that lady doing out there? Why does it have a picture of a house on it? When can we watch Rio again? Why do they have cheese potatoes? Why is there a table for the workers? What are we doing at the weekend? Can I have my food first? When can we go to Chessington again? When can we go to Alton Towers again? All houses are white aren’t they? What colour is our house? What colour is brick colour? Why did they choose that colour? Why didn’t you live together in a flat? Why is there a picture of that? Why is there a picture of a kitkat? How old will I be when you’re dead? How old do you think I’ll be? Will you be sad when you’re dead? Will you be sad when I’m dead? Why will you be very sad? How old can you stay alive for? Do some people live to be a thousand? How else can you stay alive for? Has Betty got Snow White yet? Is the flower shop next door? Did you know penguins can hold their breath for twenty minutes? What does my breath smell of? What will Poppy’s first word be? Why is it difficult to say? There’s twelve tables isn’t there? Can we sing baa baa black sheep on the way? Can I have a big bit of drink? When is it the weekend? When can we go on a seaside holiday again? Please may I have pudding? Can we buy some flowers? If someone steals our flowers can we get some? Why aren’t we selling the house any more? When’s all the paperwork going to be done? Why are we stuck together? Why are you walking slowly? Can I play with my phone? When can we go on the 322? Are we going straight to the supermarket? Why don’t we have a gate anymore? How are we going to get a fence again? Why are we going to the supermarket? Is it Monday next week? Can I put this down now? Is police cars faster than normal cars? Why are they called criminals? Why sometimes the police comes? Why doesn’t it work in that one? When can we go to Legoland? Why is it called Legoland? But why does it have Lego anyway? Can we go to Morrisons? Can I have my phone in the supermarket? Can I sit in the trolley? Why did you choose one with two seats? Why is that all they’ve got? Can I have chocolate yoghurt? Can I have a magazine? How much shopping did we get? Can you see my Paulton’s Park map? When I am Ruby’s age she will be 9 won’t she? Why will she be 12? Who are you sending a message to? Can I have the Jake music? Can I have your wedding music? Why did you let Sarah look after me instead of taking me yourself? How much times have I had this? When are we going to Sarah’s? Did you ask Kate and Betty as well? Can you ask Kate and Betty next time? I’ll be five the next time we go to Alton towers won’t I? Because it’s my birthday soon isn’t it? Nor really soon but quite soon? Can we go to that park this afternoon? What did he call to say? Can I sit in the car while you go to the post office? Please can I have sweets? Why did you say four? Where is the map from Alice in Wonderland? When can we go to that park? Shall I go and tell them it’s not a bench it’s a roundabout? Can you push me really high? Can you get my foot out? I went all the way round didn’t I? Who can I hear shouting? Why have they got yellow? Is there no such thing as superheroes in this world? Can I call Nanny to tell her we’ve got 14 Disney cards? Can we make a chocolate lolly? Can we watch TV please? Why have you given me four – I said five? What can we have for pudding? Did you have that when you were little? Am I too big for it now? Please can I have another pudding? Why do they put it in a strawberry? Can I have another pudding? Can you get me a spoon? Can we make these now? Why isn’t it coming out? Why is it still not coming out? Was that a police car on this programme? Please can I have a go? How did you cut this off? What begins with a c? In case you weren’t counting, that is around 180 questions, which works out to be one every two minutes. And of course every single one of these questions required an answer. So I think it’s hardly surprising that by the end of the day I can barely string a sentence together, never mind write a blog post. We own a perfectly decent and functional house. It’s great at protecting us from the wind and the rain. It has central heating, and running water, including a flushing toilet. But still we choose to leave it all behind in order to go camping. Having crammed every inch of the car full of stuff, we drive to a field and cart all our belongings to our chosen pitch. We put together our little shelter and hope it is strong enough to protect us from the elements. We sleep on the lumpy, hard floor and sit on folding chairs. The nearest running water is 100m away (and cold). The closest toilet – a wooden hut built over a big hole in the ground – is only about 50m from the tent, but that means we sometimes get a whiff of its unpleasant odour. Cooking facilities are minimal, and when we get cold in the evening we have two choices: retire to a sleeping bag, or make a fire. And after two days and nights of living like this, we take it all down and put it back in the car for the journey home. By which time everything, including us, is slightly damper, muddier, smelling of smoke, and more creased than before. So why on earth do we do it? And more to the point, why do we keep doing it? I have been thinking about this a lot. Not just over the past few days, but for years now. And it still makes no sense. I’ve tried to focus on all the nice things that can happen on a camping trip. The (occasionally) sunny weather, the toasted marshmallows, the bacon rolls, the rope swings, the slower pace of life. But I can’t find anything on that list which even comes close to compensating for the lack of comfort, the dirt, the sleepless nights, and the sheer bloody hard work of it all. Which leads me to conclude that camping is a bit like childbirth; when it’s all over you somehow manage to persuade yourself that it can’t really have been as bad as it seemed at the time. Or maybe I am just crazy. Because although we only have one child, we are planning to acquire another tent – to replace the one that collapsed on top of us in a 3am windstorm. That surely can’t be the behaviour of a sane person. Especially one who can’t explain why. Making Notes: A Load of Balls! I first came across this method of making balls at the Latitude Festival last year, where Cambridge Community Circus were running workshops for kids. They were making juggling balls, but the finished product also works quite well as a stress ball, and I even used one to go with a set of skittles I made. Begin by tipping some seeds into the jug. I tend to do this, and the next few steps, over a roasting pan or high-sided tray, to catch any stray seeds. Cut the necks off a couple of balloons (don’t throw the necks away). You can use balloons of the same colour, or different colours, depending on what effect you want. Carefully pour seeds from the jug into one of the balloons. If you can recruit a helper to hold the balloon upright for you, the process will become much easier. When it’s full, take the other balloon and put your seed-filled ballon inside it, facing the opposite way, so that the second balloon covers up the neck hole of the first balloon. You might need to trim a little from the neck hole on the second ballon so that it fits snugly. You now have a basic seed-filled ball. If you just want a simple juggling ball for practising your own circus skills, then you can stop there (although if this is your plan you might want to add an additional step: put the seeds into the corner of a small sandwich bag and tie a knot in it, before adding the first balloon layer – that way you are less likely to get any spillage). But in my experience, a ball made with just two balloon bodies like this has a tendency to settle into a sort of lemon shape, and that bugged me enough to make me fiddle about with it in search of improvements. I have found that using the leftover neck pieces as further layers helps to make a much more robust (and spherical) sphere. Cut off the very end part of the neck, which has the little rollover, and simply stretch the remaining tube over your ball, covering up the baggy ends that cause the lemon tendency. You might need to trim the ends of the neck further in order to get a snug fit. You can add as many layers as you want, until you are happy with the strength and shape of your ball. 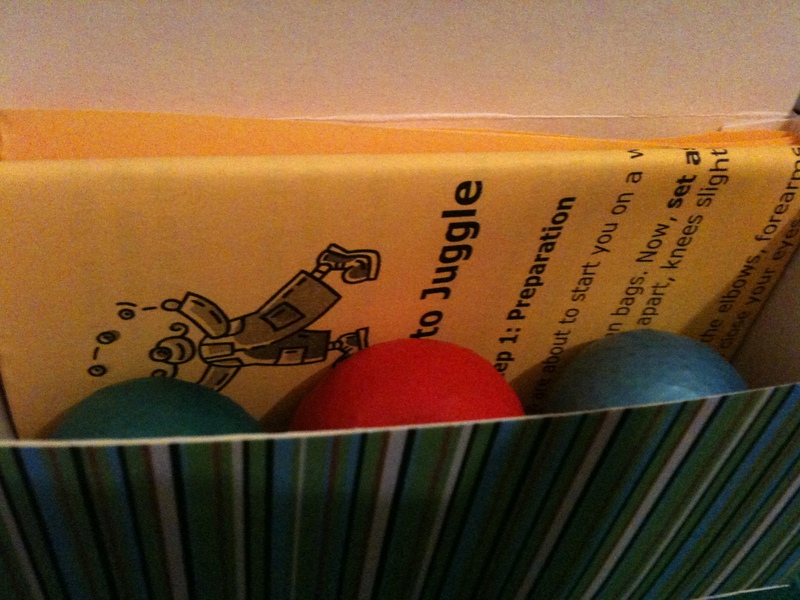 To make up a juggling ball kit I put three balls inside an old tea bag box which I covered in patterned paper, and added a set of instructions printed from the internet.